Please find attached pictures of my newly built Xtracycle. 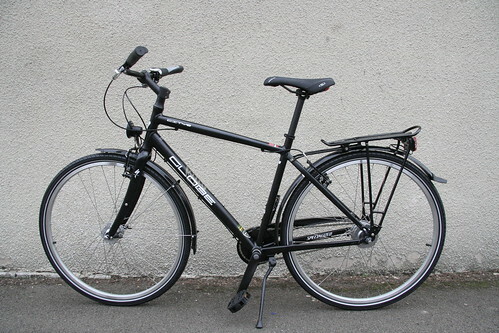 The donor bike is a brand new Specialized Globe City 6, with 8-speed hub gears and dynamo lights. I carefully spray painted the Xtracycle frame matching satin black before fitting it and it looks a treat. I changed the twist-grip gear changer for a trigger one, added a chain tensioner on the back and fitted better V-brakes. I've mounted the rear lamp underneath the back of the Top-deck, out of harms way. 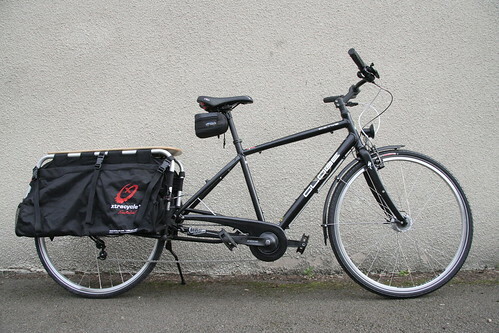 I live in a town called Lutterworth in Leicestershire in the centre of England, and it's the only Xtracycle in town! I love going out on it and find any excuse to go on an errand. She gets lots of attention every time I take her out. The only other change I'm planning is a sprung Brooks leather saddle for comfort. I'd love to fit the H/D twin leg centre stand but I can't justify the expense. Hope your able to find a spot on your Xtracycle gallery for my bike. Keep up the good work. I think I've more-or-less decided on the B67 model for the Brooks leather saddle but I can't make up my mind on colour. Black to match the paintwork? Maybe traditional brown? Or even honey for a complete contrast?... One does so want it to look right. "I changed the twist-grip gear changer for a trigger one" - how easy is that to do and what does it involve? It has the correct ratio for working with the Nexus hub gear. You can't just use any 8-speed shifter. It is available in black too. I believe for more money you can also get it with a combined brake lever. It's a doddle to change the twist grip for the trigger shifter, it's complete with a new length of gear cable. I didn't have to adjust the cable at all, just followed the fitting instructions and it worked immediately. You'll need to purchase new full size grips too. I recommend the conversion if like me you dislike the twist grip. How did you paint the frame? And: Does it still look great or has the color took damage? Hi teiml. I spray painted the Xtracycle frame with acrylic Satin Matt Black aerosol paint. I spent some time rubbing down with wet-and-dry paper and priming it with grey primer first because I wanted it to look good and last. I gave it several layers of Satin Black. Difficult to see in the photo, but it looks fantastic. Definitely worth the time and effort. It also makes it harder for people to spot that it's actually an add-on, bolted on to the back of a regular bicycle. Matching the Xtracycle colour with the bicycle colour makes it look like it's all one machine. The paintwork is lasting really well, with no damage at all. If you're thinking of painting your frame to match the bicycle I would definitely recommend it. Try taking your bicycle to the local car shop and getting as close a colour match as you can.